Why should you transfer ownership of your horse? Think of it as transferring the title to an automobile. The horse is duly recorded in the books of the PSHR as belonging to you. Transferring ownership of your new Pleasure Saddle Horse into your name as soon as you purchase it guarantees that you will be able to maintain the value of the horse as a registered animal. The PSHR does not consider you to be the legal owner of the horse until it has been transferred to you. 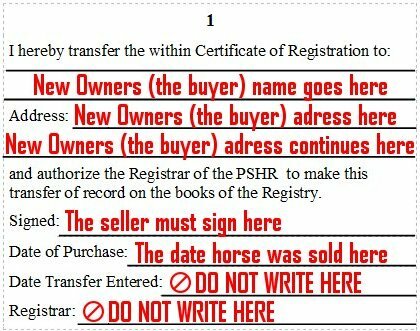 To transfer a horse, the PSHR must have the signature of the seller on the back of the registration papers. If you delay in filing the transfer application with the PSHR, the odds of the registration papers becoming lost increase, and locating the seller years after you buy the horse also becomes increasingly difficult. Paying the transfer fee now will save you hours of frustration and expense further down the road. If papers are lost they can only be replaced by the registered owner of the horse. If they have not been transferred into your name, the PSHR does not consider you to be the owner. How to transfer your Pleasure Saddle Horse's papers into your name. To transfer your new Pleasure Saddle Horse you should complete one of the transfer blocks on the back of the original certificate. The previous owner will need to sign the back of the certificate and you will need to fill in your information and the date you bought the horse. You do not sign the back. The person you bought the horse from must sign and your name and address must be filled in on the back, along with the date of purchase. The "Date Transferred Entered" and "Registrar" are to be completed by our office. Send the original certificate to the PSHR along with the transfer fee. PEASE NOTE: You will not receive a new certificate of registration. Ownership of horse is transferred by the block on the back of the papers. The original certificate will be returned to you after the transfer has been duly recorded in the Pleasure Saddle Horse Registry records. IMPORTANT: You may pay the transfer fee online via PayPal, but you must mail the original certificate to us via US Mail in order for us to complete the transfer. Payments must be made in U.S. dollars. We do accept PayPal.